It’s our first full weekend living in Moclín, and yesterday was spent getting used to our surroundings, in a fairly sedate manner. This involved driving to the nearby village of Íllora to see what it was like, and then having lunch. Poor Íllora has seen better days, although the Duke of Wellington owns a finca very near here that saw an influx of Royalty, Rich and Famous in 2016 for the wedding of the Duke’s daughter, Lady Charlotte Wellesley. The estate was one of two given in 1813 by the Government of Spain to the Duke of Wellington in perpetuity as a token of appreciation for Wellington’s help during the War of Independence against Napoleon. Íllora was also one of the Siete Villas on the edge of the moorish Nasrid Kingdom that, when the Catholic King and Queen conquered Granada, became the producers of the city’s grain. Montefrio, Íllora, Moclín, Colomera, Iznalloz, Montejícar and Guadahortuna are the seven villages that mark out the Montes de Granada region, and this part of the province is rich in history and agricultural heritage; there have been settlements here dating back to the Paleolithic, Neolithic, Copper Age and Bronze Age. So, despite this incredible history, it was rather sad to see that Íllora has a neglected air about it, and we rather hope that, with improvements in the Spanish economy and an increase in sustainable rural tourism, this beautiful area will gradually benefit. We had hoped that we might find a place for lunch in Íllora, but after nearly grounding the car on a very tight side street, my keenness for further exploration rather waned, so we hot-footed it out of the village and took another route home. We have visited Tózar before, as it is a village we can see from our own village of Moclín, and the last time we went it was in the winter and bitterly cold. This time, as temperatures nudge towards the mid-high 30s, we thought we’d give the bar another go, and found the village to be in the middle of a fiesta. El Rincon de Marcelo is, we discovered, quite a large affair towards the top of the village. In the winter, it looked far smaller and we had little idea that it has an extensive restaurant, bed and breakfast accommodation and……a rooftop bar! We love a roof terrace with drinks, and this did not disappoint. The terrace was large and plenty of sun umbrellas did their best to diffuse the heat; the sensible Spanish tucked themselves downstairs in the much cooler bar and restaurant areas, but we wanted the view. 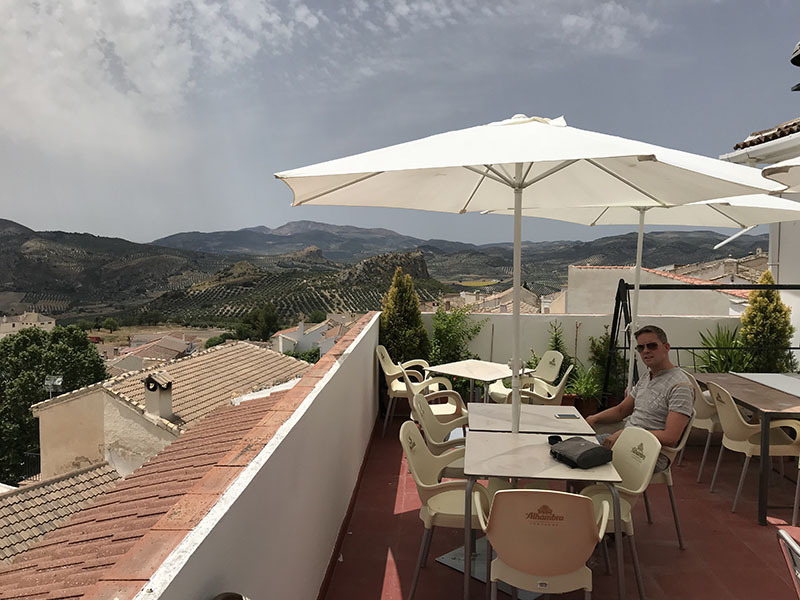 We had rather a fabulous lunch, washed down with large icy glasses of Tinto de Verano (red wine and lemonade) and Clara (shandy), taking in the equally fabulous views across to Moclín. We decided, following that lunch, that on Sunday morning we’d tackle the local walk that is something of a draw in these parts. 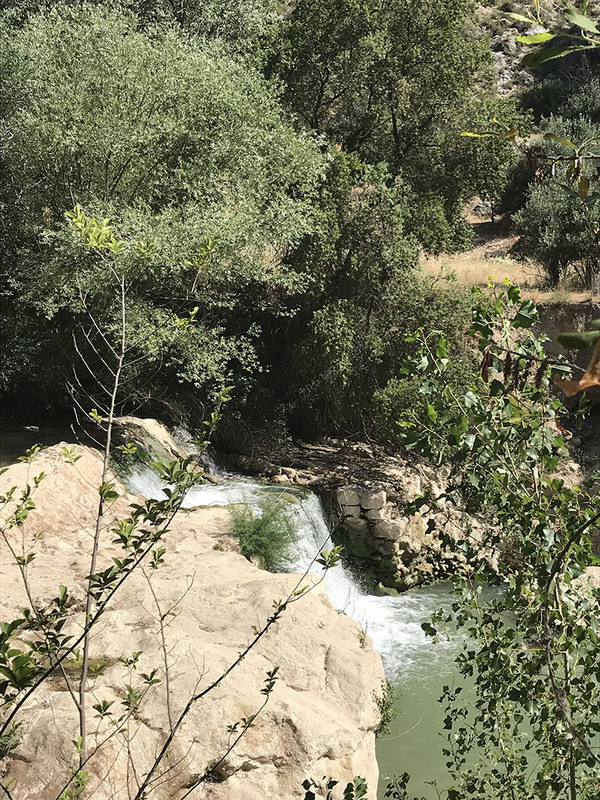 Since we bought our house here, we have been interested to explore the various walking, hiking and cycling routes (well, leave me out of that last category), and La Ruta del Gollizno lies at the heart of the region. 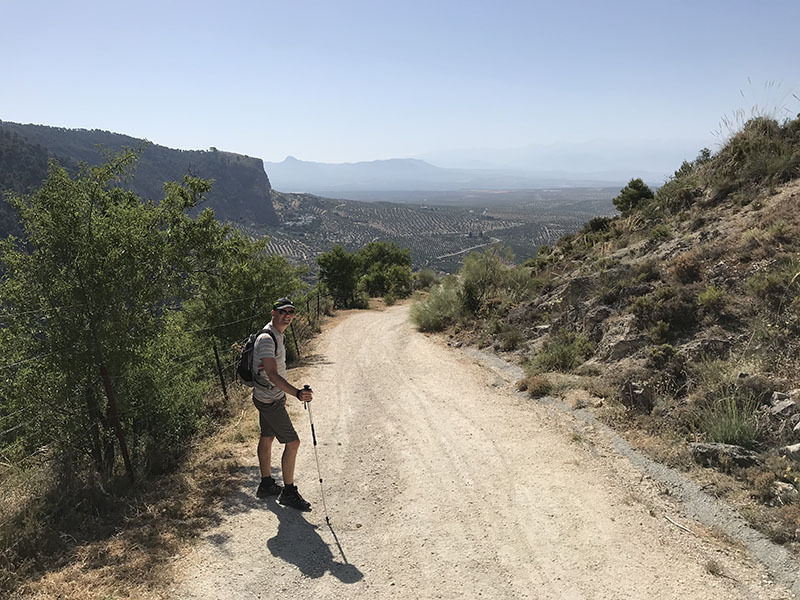 The main walk is a circular route, starting and finishing in Moclín, but there are numerous offshoots filtering out into other parts of this western corner of the Montes de Granada joining up, in parts, with the Ruta Camino Mozárabe and the Ruta del Califato. The distance is approximately 8 kms but with a variation in altitude of 620 metres. Now, this might not sound that much but in summer heat and with many fairly steep sections, this walk really took its toll! 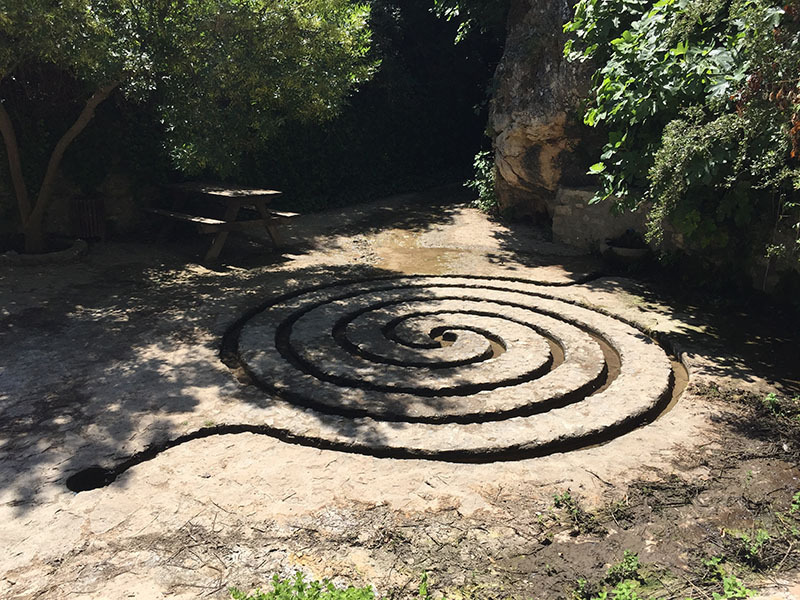 We started at a relatively sensible time, but on the homeward stretch there were moments when my heart must have thought I was completely mad. 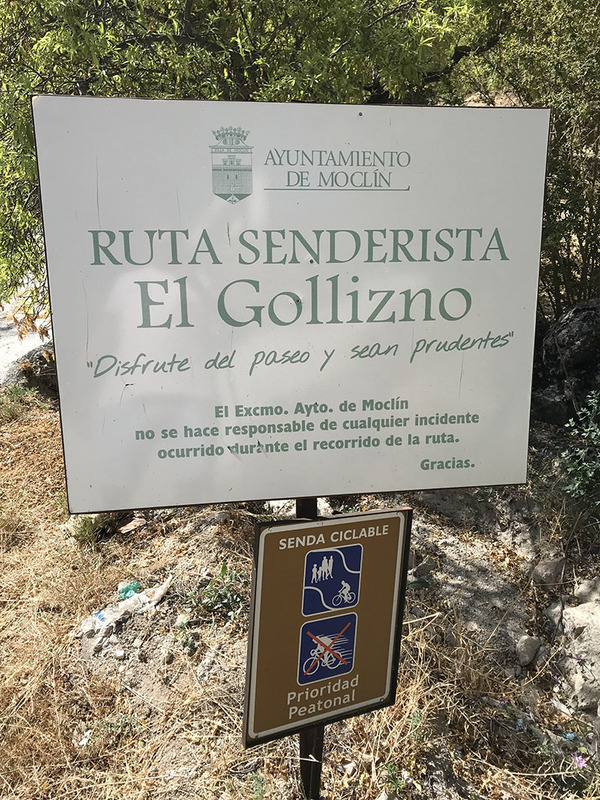 We have been in Moclín before on a Sunday (the day for family walks), and the route is popular with Spanish hikers in the know, but other than that it seems to be a very well-kept secret. 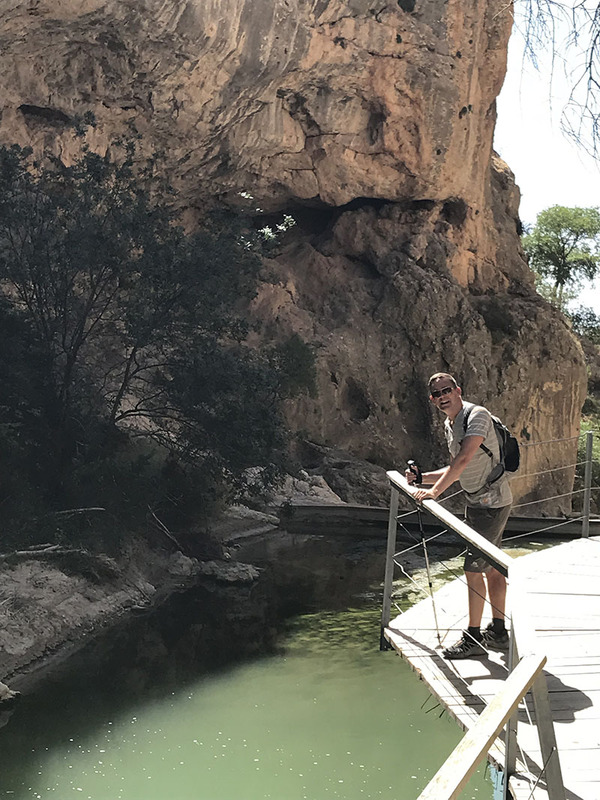 It is stunning, and offers variety in so many ways, from the changing landscapes, flora, fauna through millennia of history from Prehistory right through to the far more recent and raw Spanish Civil War. 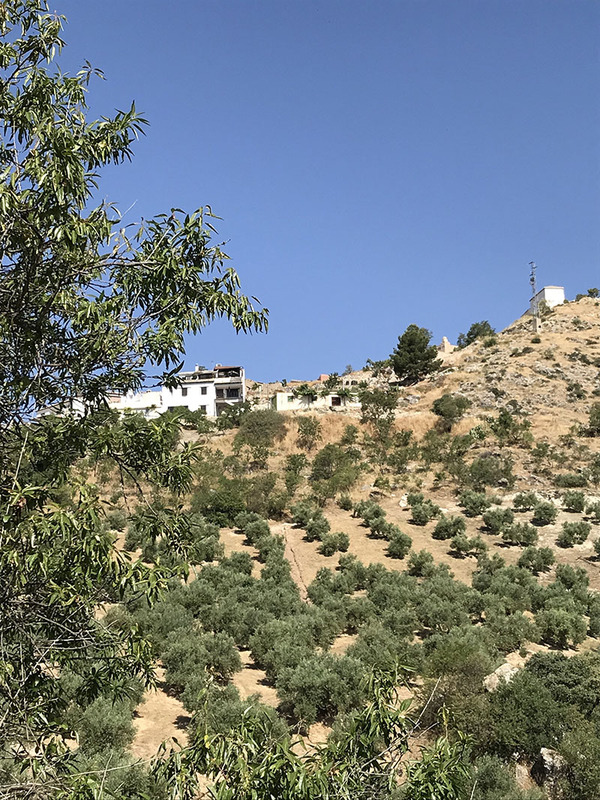 We set off heartily, taking a track from the centre of the village (right outside our little apartment as it happens) and descending through olive and almond groves as we left the village behind. We could see, on the edge of the village, our new house taking shape - the little building that will become our studio perched on the edge of the barranco and with stunning views over this part of the countryside. 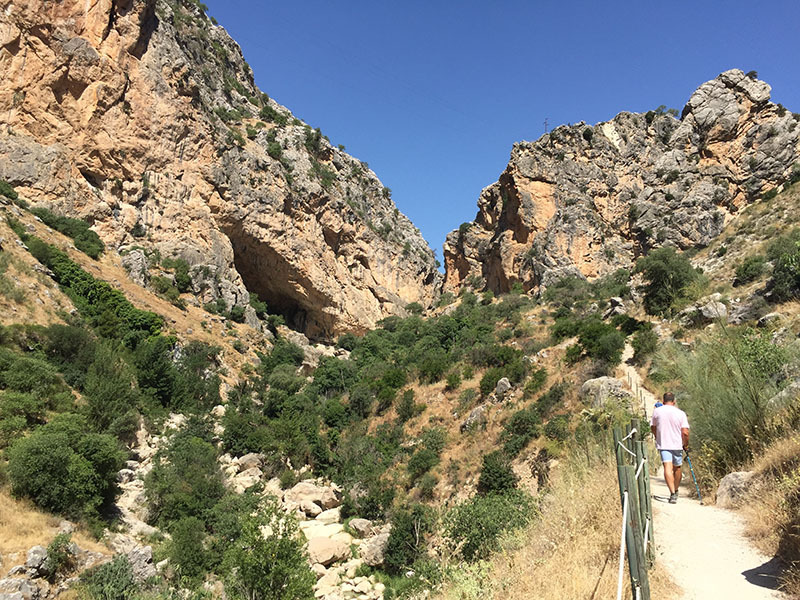 The first leg of the walk is an almost constant downhill to the neighbouring village of Olivares, sitting low in the valley of the Rio Velillos, the water coarse responsible for creating the gorge through which we would walk. The sun was getting hot, and these southern slopes offered little by way of protection until we neared the village, and a wedge of pine trees then provided some respite. Warmth, the scent of pine and the relentless chirruping of cicadas. 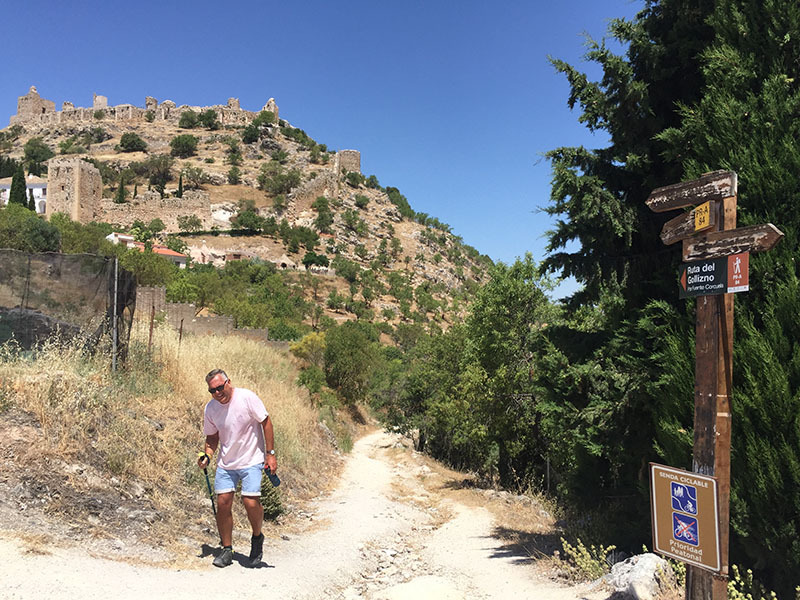 At the bottom of the hill, the route turns away from Olivares, although it makes sense to nip into the village for a halfway drink before attempting the next leg. 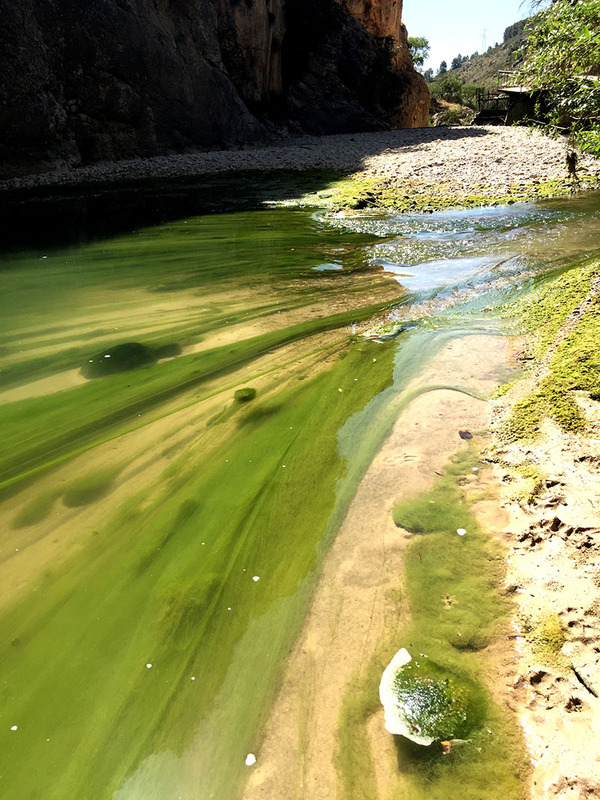 The landscape then changed as we followed the river as it tumbled down over giant boulders and into turquoise and aquamarine pools dappled by the bright sunlight filtering through the canopy of trees. This was a glorious stretch, and the temptation to throw caution (and clothes) to the wind and plunge into a pool was enormous. Track turned to footpath as it wove further into the gorge, and the massive cliffs closed in on either side and then, gradually, the climb began up through the rich vegetation, and past the cascading waters, into another world. 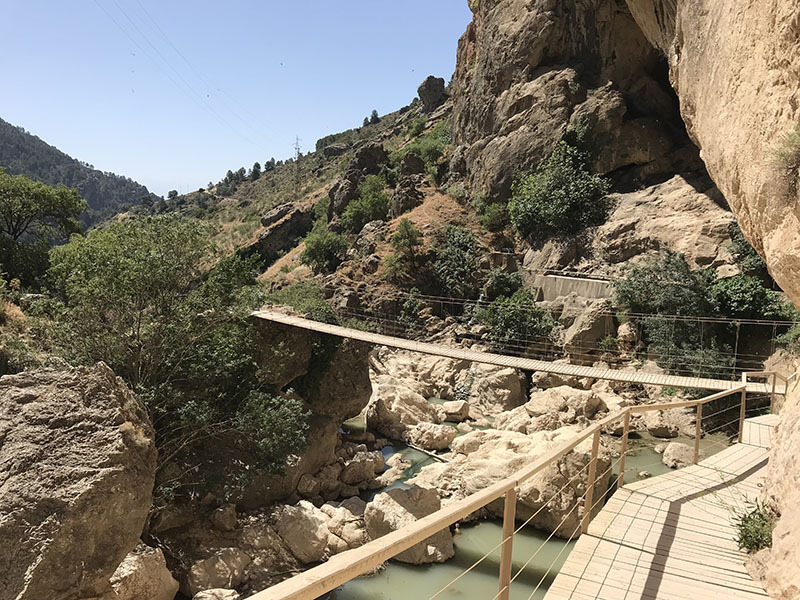 As we left the river below, we caught sight of the huge gaping mouth of a cave punched into the side of vertiginous rock, and the stony path clambered up to meet a rope bridge crossing the river. I’m not great with heights, and although this bridge looked well-built, it was suspended on cables and cables have a habit of moving. 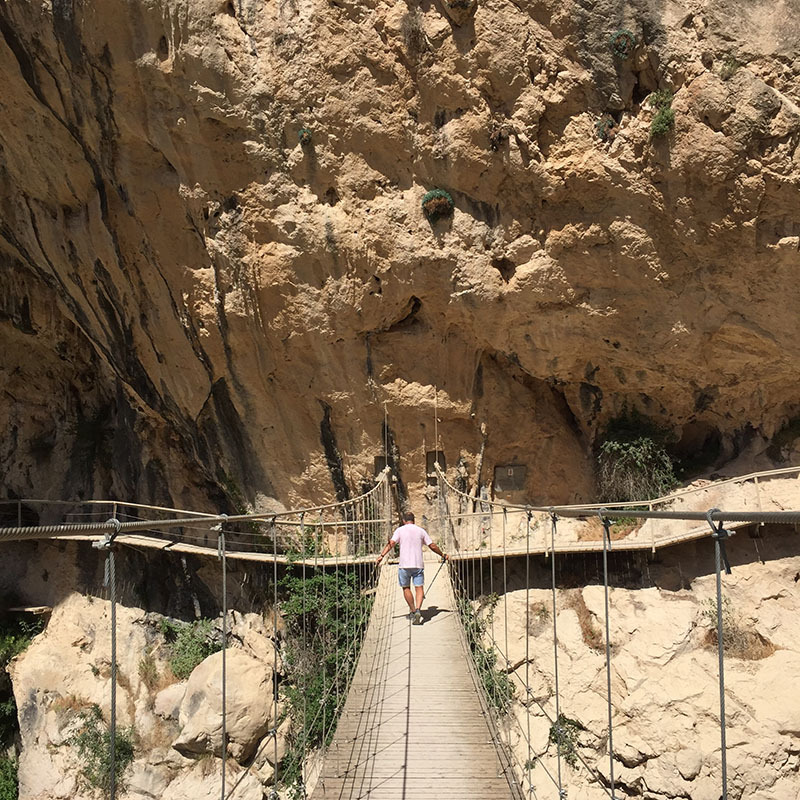 So, we set forth as the bridge swayed and wobbled to get to the mouth of the cave and join the cantilevered footpath along the side of the cliff. What a magical setting, more impressive than many a film location and with such a strong sense of prehistory that it was almost tangible. The uphill climb became more relentless and the temperature followed suit. As we emerged from the river bed, once again we found that we had little by way of protection from the sun and, although we were slathered in sun cream, you do become aware that the sun is pounding down on the top of your head. Andrew was sensible and wore a cap; I, on the other hand…. In the saddle between two mountains, we started the final leg of the route and met two more intrepid Spanish couples, all looking rather fresher and gung-ho than I did at that time. Mind you, they were just starting and we were on the final stretch, so what would they look like after a further 2 hours, I wondered. Both couples were chatty and immensely helpful. 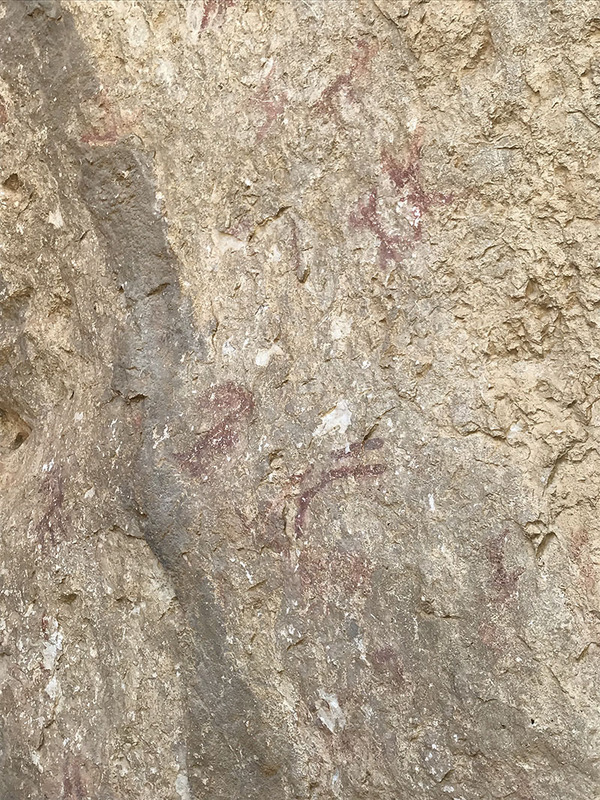 On this route, there is a cave with Prehistoric drawings on the walls, and we were keen to know the whereabouts of this cave. There are several such caves in the area, and we will be exploring more, but maybe not today. The Cueva Corcuela is signposted but not obvious, and it was useful to bump into a couple who had just been to see it. Although I was convinced that I was on my last legs, and would never make it out of this Jurassic Park alive, we did venture off the main route and along a short path to the cave and there, on the wall, for anyone to see, were the set of drawings dating back so many thousands of years that I find it hard to contemplate; quite extraordinary. The path continued onwards and upwards, through pine forest and out into the open, mountains to either side and stunning views wherever we looked. Eventually, we saw Moclín Castle and we could well have time-travelled back to the Middle Ages when this was such an important strategic place. The sight of the little Ermita that sits just above our new house was enough to give me the momentum to tackle the last bit of the climb. That, and the fact that Andrew and I were being pursued by some rather persistent horseflies - I think I may even have broken into a run at one point (OK, a very short and feeble trot, but let’s not split hairs). Bar La Plaza waited for us at the end of our journey back in time. A couple of ice-cold claras (shandy), and tapas, revived us body and soul…..well, enough to get us back to our little apartment on the other side of the square where we both immediately collapsed on the bed and fell asleep.